I don’t know when ornamental grasses began to gain popularity but I’d say that 20-25 years ago, few gardeners used them regularly. 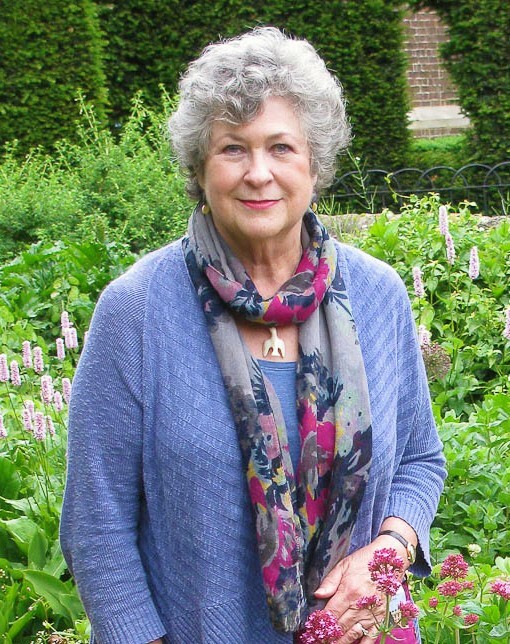 Thanks among others to designers like Piet Oudolf from Holland and James van Sweden and Wolfgang Oehme in the U.S., perennial grasses have become popular staples in many gardens. 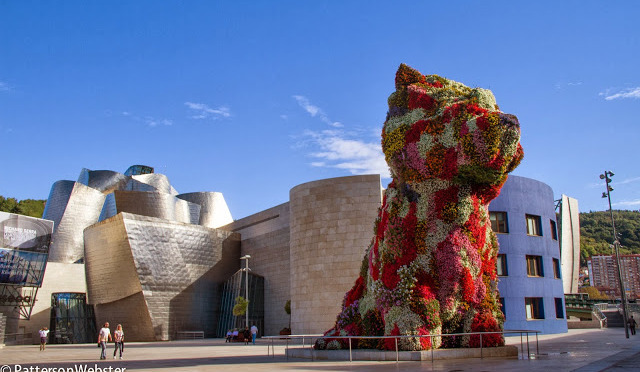 Their fluidity suits a looser, more naturalistic approach to garden design; in turn this more naturalistic approach reflects a modified view of what gardens are, or can be, and how gardens relate to the landscape around them. I first planted an ornamental grass at Glen Villa about 12 years ago, a switch grass called panicum virgata ‘Heavy Metal.’ It wasn’t well sited — it quickly outgrew its location — and I moved it after a year or two to a more appropriate spot, behind a big rock on the lawn, where it sways in the lightest breeze, a fine contrast to the unmoving rock. ‘Heavy Metal’ plays its part now between a rock and a soft place, the grass beyod. It is highlighted in autumn by the fuzz of maple leaves. 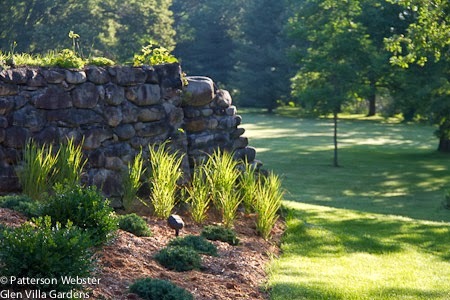 I used switch grass this summer in the plantings around the aqueduct. I chose the cultivar ‘Shenandoah’ because of its name — I grew up in Virginia and the Shenandoah valley was very much part of my childhood. Planted beside the old stone wall that forms a background to the aqueduct, ‘Shenandoah’ looked glorious on an early August morning, with sunlight illuminating the green blades. Even when young, these blades are tipped in red. The picture below, from mid-October, shows that characteristic colouring. I’m particularly pleased by the contrast between the wine red and the grey fieldstone wall. As the grass matures, it will get bigger and better. 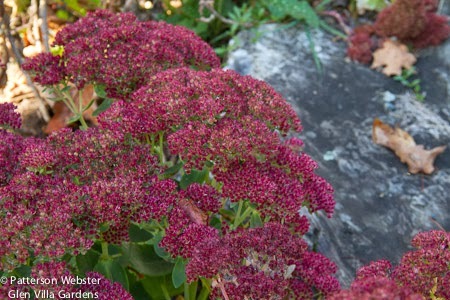 Next summer ‘Shenandoah’ should be topped everywhere with a reddish pink inflorescence that I hope will be stunning. mirroring the contrast between the falling water and the stillness of the reflecting pond. I like the arching green blades of this calamagrostis. while the blossoms are airy enough to offer a contrast. Those pink inflorescences catch the light beautifully, particularly after rain, and blend nicely with the colour of the steel planter that is just now beginning to rust. looks soft against the rusting steel planter. The third grass at the aqueduct is sporabolous heterolopsis, or prairie dropseed. 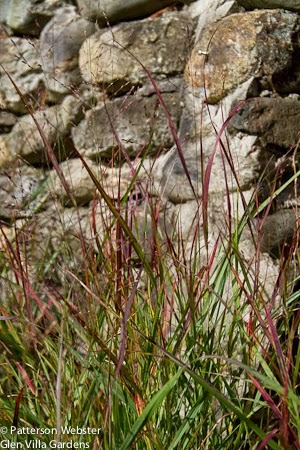 When I saw this grass last fall, growing at le jardin plume, in Normandy, I immediately fell in love. The plants were arching mounds of gold with orange hues, and they smelled spicy, a bit like coriander, a scent I like. 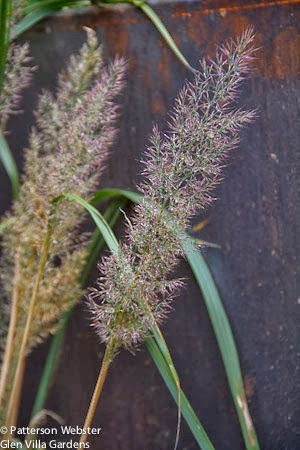 Prairie dropseed is a North American native grass with pink and brown tinted blooms, said to be easily grown in full sun in all types of soil. 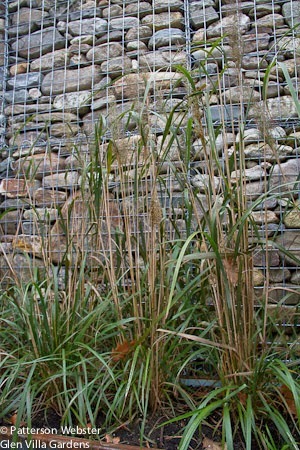 It is less commonly used than many ornamental grasses because it is slow to establish, grows slowly and doesn’t self-seed freely. 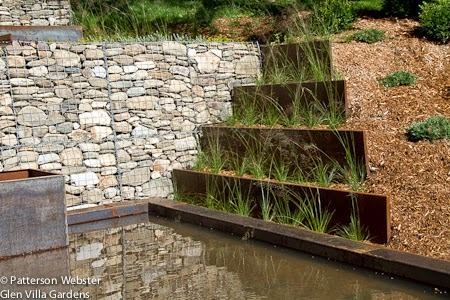 But since it prefers dry rocky soil, it seemed a good choice to use between the steel plates that hold the bank above the reflecting pond. My plants are tiny, so it will be a few years before they begin to shine. But I think the results will be spectacular when they do. 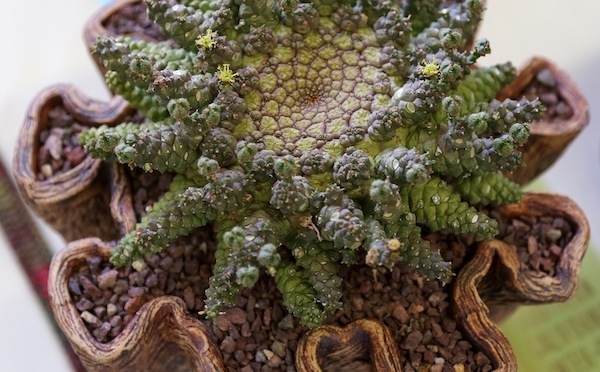 These tiny plants will grow, eventually. 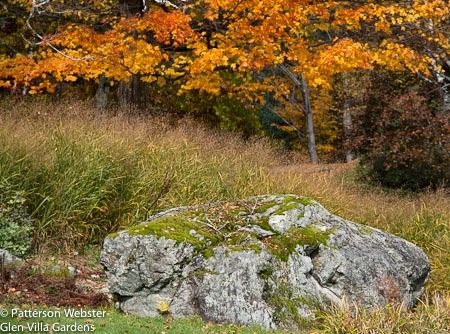 I plan to write more next week about the ornamental grasses I’ve used in other areas at Glen Villa. I’ll also return to the subject of the aqueduct: the final work is going on now. It’s been a long haul — but when I look out my kitchen window and see the water falling, even more, when I hear it moving from level to level, I am deeply satisfied with the results.